Customer feedback is really important to us. It lets us know how we’re doing, allows us to improve and ensures that standards remain high. We now have several ways that you can give us your feedback, depending on what’s the most convenient method for you. Because we really do appreciate you sparing your time to do that we will be running a monthly draw to win a £25 M&S gift voucher. Everyone that leaves us their feedback via any of the methods below each month will go into the draw (just make sure you leave your name so that we can get in touch). You will find our customer satisfaction surveys here. The survey only takes a few minutes to complete. You can leave your comments on our Facebook page or message us on Twitter. If you have a Google account you can leave a review on our Google + Places page. The good old fashioned way! As great as online methods are there’s no substitute for talking to our customers so please feel free to give us your feedback over the phone by calling 01924 371941. 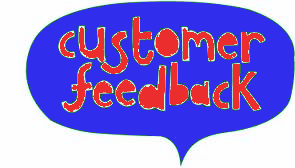 You can see some of the things that other customers have said about us on our Testimonials page. Keep checking the Facebook page where we’ll announce the winners every month. previous Jordan Makes the Grade!